Got an interesting link, story, or screenshot for Signal vs. Noise? Contact svn [at] 37signals [dot] com. Matt Linderman wrote this on May 14 2007 There are 25 comments. RE: The MySpace search … it may not be a bug, but a feature. Sure can’t hurt the site traffic to generate more clicks, huh? 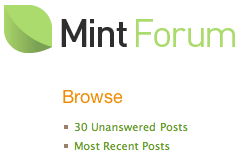 The (beautiful) Mint forum actually shows all unanswered posts (32 at this moment); 30 was just happenstance. Most forums actually show unanswered posts… vBulletin does it by default, as does phpBB, and PunBB (see the link at the bottom of the old Basecamp forums: http://basecamphq.com/forum-archive/ ). I do the captcha thing on my contact page by having the visitor solve a simple addition problem using a few numbers generated by the PHP rand(0,9) function. Tim, I recently implemented the same method as well. I even use it for my comments. However, I make mine multiplication and I use two random numbers between 1 and 99. A little harder but it’s actually worked at keeping out the spam. (yes, that old error message is embarrasing. yes, we have made improvements :^). I guess it works in the short term because it’s different, and as long as every random blog invents their own captcha test, maybe it becomes not worth it for botnets to care… and maybe that’s enough. What is Kevin’s first name? 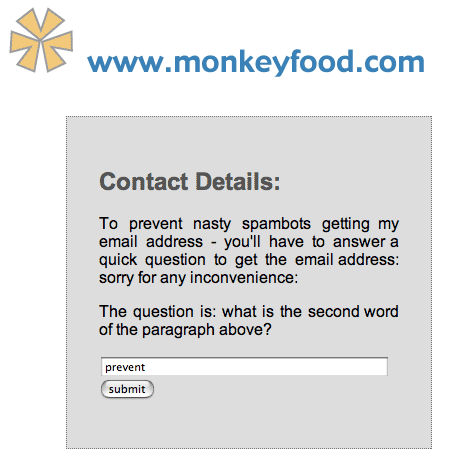 The bummer about the Monkeyfood captcha is all the reading! The text-only design wins for accessibility, but when I see a captcha, I know what to do, and I don’t have to read more than 6 letters in the process. It’s a nuisance, but at least it’s fast! Hey Robert…don’t mean to undermine a fellow Yahoo, but you need to check your facts. The screenshot is perfectly valid. 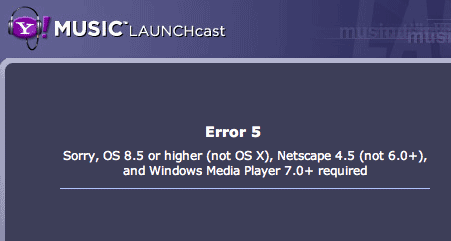 The error is for the LC radio player, not the new video player. The radio player still uses WMP to stream, not flash, so it is only really supported on PCs in IE. I believe the reason it isn’t supported on recent Macs is because there is no WMP plugin for any of the Mac browsers. Ditto for FF on PC. I suppose it is supported in that narrow range of requirements (OS 8.5+ but < OS X and NS 4.5+ but < NS 6.0) , but I’ve never even tested that scenario as that is not on our list of supported browsers. I think it’s more of “Hey, if it works great”. Regarding CAPTCHA, this is a good resource that contains some different methods of fooling spambots. All of the captchas referenced here are barely speed bumps. A real captcha is very hard for a machine to answer. The ones above are simple. My favorite Captcha is the one Jeff Atwood uses. It uses the same clearly readable word, “orange”, (contained in an image) every single time. He claims that it keeps almost all of the comment spam out. What’s wrong with the usual captcha? If you ask people to add small numbers, you create a high probability of just being able to guess a number and have it be correct. And also I don’t think anyone wants to do mental math (especially multiplication or large addition) and then mess up and feel stupid. @Karl N – The problem with the usual (image with letters/numbers) CAPTCHA is that blind people are mistakenly classified as computers. Personally, I feel companies should deal with spam behind the scenes and leave CAPTCHA’s out all together. Why is it OK to lessen your workload by inconveniencing your users? 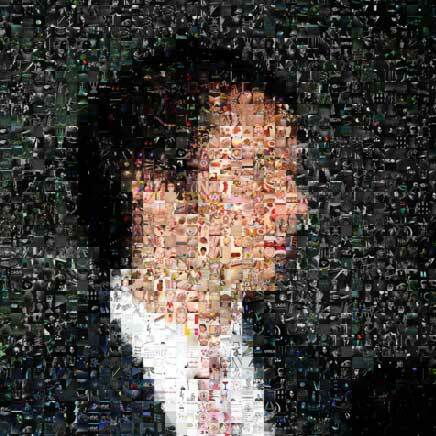 Wow, something on MySpace that actually sort of almost looks good (well, a little bit). @Karl N: Computers are quickly becoming more adept tha humans at workig out what the classic image CAPTCHA says. The w3c have a pretty interesting article on CAPTCHAs outlining the history, problems, and suggested solutions to the prblem they try to solve. Complaining about a particular MySpace feature’s lack of intuitive, common-sensical, or efficient functionality reveals a user who hasn’t actually used the site. Across the board, one would be hard-pressed to find anything about the interface that didn’t elicit a shudder; singling out this point seems like missing the forest for the trees. Still, there’s a certain logic operating here: The author bemoans the interface ‘caus[ing] you to waste time’; by its very nature, MySpace is about nothing if not wasting time.